It's almost Spidey time - a week away! Though I know we're almost hitting Spider-Man overload, with only one week left until it hits theaters, and an endless barrage of marketing in the form of trailers, virals, "super previews", banners, posters and more posters. 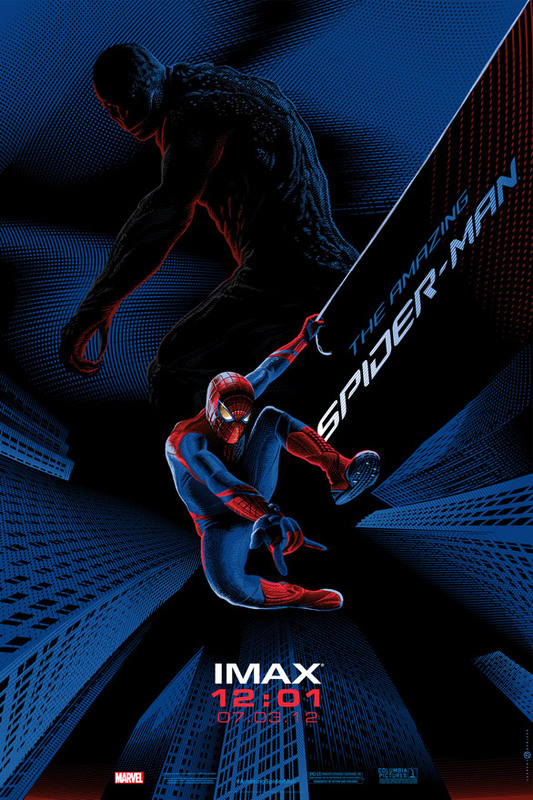 However, this latest and hopefully final poster for Marc Webb's The Amazing Spider-Man is the official IMAX midnight poster, that will be given out to those attending 12:01AM IMAX 3D showings next week. And honestly, it's pretty damn cool. Or at least I hope die-hard Spidey fans like it, because it's very different and yet sleek, I really like it the look of it. I want one! This Amazing Spider-Man IMAX poster was debuted by MTV (via ComingSoon) seen here. Who wants one?
. . . Killer Croc is in this new Spider-Man movie? They know all about The Lizard, right? No it is the Lizard, he just has rougher scales and looks more like an Iguana than a Gecko or Salamander. It does look very confusing at first glance, and I personally would've went with a thinner, longer and more agile frame (not thin like Spidey but still) or at least smoother scales. But the easiest way to distinguish the two is Killer Croc is DC and The Lizard is Marvel. I like it, it looks like a fancy comic book cover. I think it's a nice throwback to the franchise's origin. I can't believe some people are still hating on this new Spider-Man movie. Sure Raimi's Spider-Man Trilogy was good but the stuff they're putting into this movie far out weights the original Spider-Man Franchise. Andrew Garfield is a way better actor than Tobey, for starters, than we have Emma Stone who plays an adorable Gwen Stacy. The cast is way younger and far better. This will be so much better. Not hating on new Spidey, but Garfield is not "a way better actor" than Tobey. I admit I've only seen Garfield in The Social Network, and was not impressed by anything in that movie. I still give him the benefit of the doubt, however Tobey has a resume full of great films and performances. Please keep in mind the original Spiderman films are a campy, damn near cartoonish set of comic book movies, so comparing them to the new 'realistic' film (as far as 'weight') would be unfair. Like comparing Nolans Batman's to Shumacker's... although I think the new Spidey is trying to balance the campiness of Batman Forever and the grittiness of The Dark Knight, like Tim Burton did beautifully in his Batman movies. Perfect Answer Dear Akira , I see A-Boy from Garfield , realistic and very effective performance , he did absolutely great job on that too, can't compare it to Social Network but really Grap Me , for indeed. SPOILER ALERT!!! Dont know where to post this so I'll post it here as I wan't to get this of my chest. After watching the end credits of The Amazing Spiderman today there is an extra scene where Conners is met by a stranger in the dark. When googling for information on who this man of mystery could I came across a couple of posts quoting a Belgian reporter suggesting Conners would become Hobgoblin/Proto-goblin in the next film. Let me tell you right here this is BS. In my view the story arcs all point to the next villain being the Vulture accompanied possibly by Norman Osborn in one of the goblin forms. Watch the episode Shriek of the Vulture (S02E13 of Spiderman TAS) after watching the movie and I think you will get a glimpse of what I'm sure will be the sequel!